Created by American researcher, documentarian, and musician Victoria Vorreiter for over a decade, Tribal Music Asia is the home of the Resonance Project, a dynamic multi-media archive that aspires to record and preserve the traditional musical heritage of the indigenous peoples living in the mountains of Myanmar, Laos, Thailand, and China, who have depended for millennia on “the mother tongue method” to transmit their ancestral knowledge, history, and beliefs. Numbering over 130 groups and subgroups, most of these communities continue to live close to the earth, to practice animism, and to maintain a vital oral tradition. Culturally and sonically, this is one of the most extraordinary places on the planet. By interweaving a variety of visual, aural, and tactile components, the Resonance Project spotlights these highlanders’ astonishingly rich soundscape—springing from a vast repository of songs, chants, invocations, and instrumental music—to demonstrate music’s vital role in charting human emotions, celebrating cycles of seasons, marking the arc of life, and animating ritual enactments. It is hoped that in giving voice to cultures that may seem remote, this project contributes to an awareness of our world that transcends borders. The Resonance Project first produced the Songs of Memory: Traditional Music of the Golden Triangle multi-layered project (April 2009), consisting of the Songs of Memory Book, Compact Disc, and Multi-media Exhibition of photographs, films, musical instruments, artifacts, and textiles for a family (father, mother, son, and daughter) of the six major ethnic groups in the region: Akha, Lahu, Lisu, Mien, Hmong, and Karen. “Songs of Memory”, front cover of the book. The Songs of Memory collections have been hosted in such prestigious venues as the East-West Center, Hawaii; the Jim Thompson Center, Bangkok; the University of Mandalay, Myanmar; the Golden Triangle Gallery, Chicago; the Chiang Mai Arts and Cultural Center; and numerous international conferences at Chiang Mai University, Thailand. 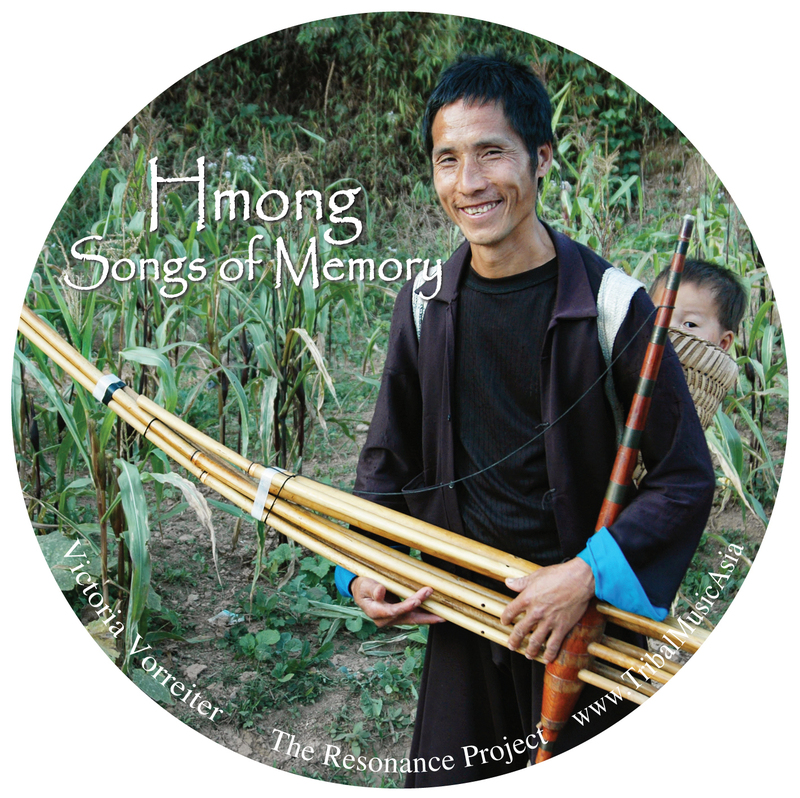 In recent years, the Resonance Project has specifically delved into Hmong traditions, producing the Hmong Songs of Memory: Traditional Secular and Sacred Hmong Music archive, based on the Hmong Songs of Memory Book and Film (December 2016), which offers readers, viewers, and listeners an in-depth experience of Hmong music and its primal role in propelling their rites. 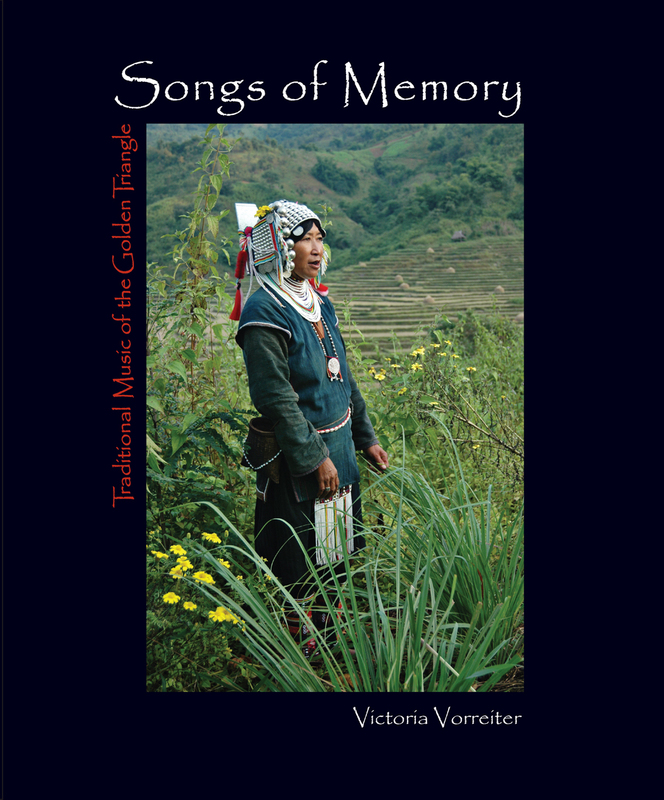 Cover of the “Hmong Songs of Memory” film. To bring the book and film alive, the Hmong Songs of Memory, Hmong Threads of Life Exhibition was launched, providing visitors with a variety of integrative components—photographs, film, a comprehensive collection of Hmong musical instruments, artifacts, detailed text panels, and full textiles of the four major Hmong subgroups in Laos and Thailand. 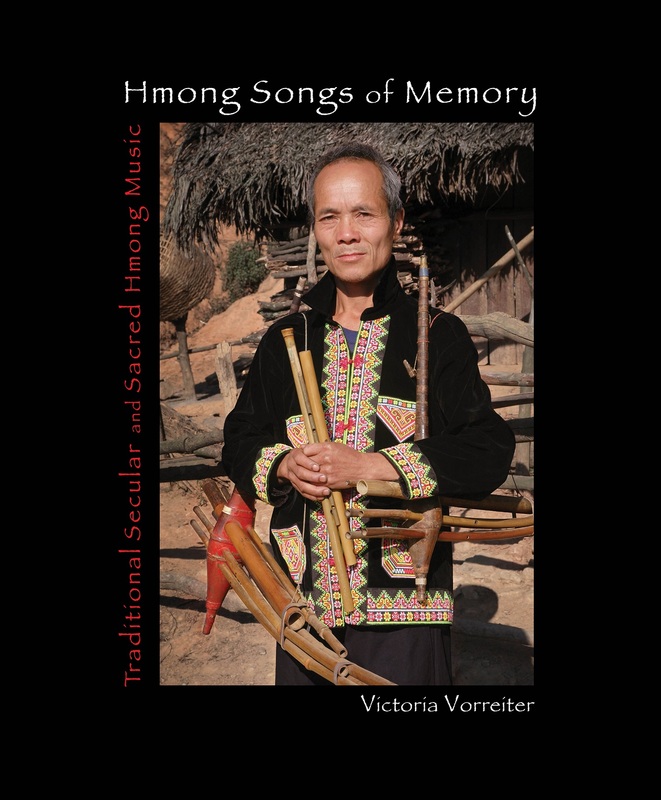 “Hmong Songs of Memory”, front cover of the book. 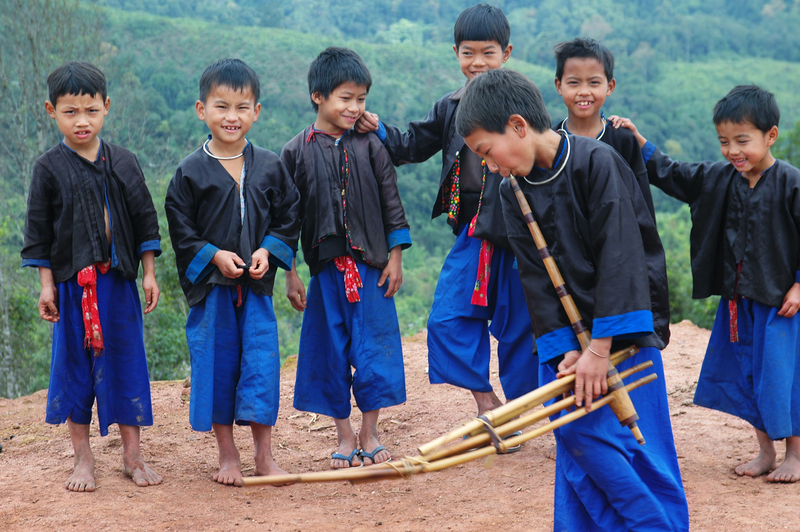 The Tribal Music Asia website provides access to recordings of Akha, Lahu, Lisu, Mien, Hmong, and Karen music, various publications and reviews, photo galleries, and layouts of recent and previous exhibitions. It is possible to directly order books, CDs, note cards, and documentary films. 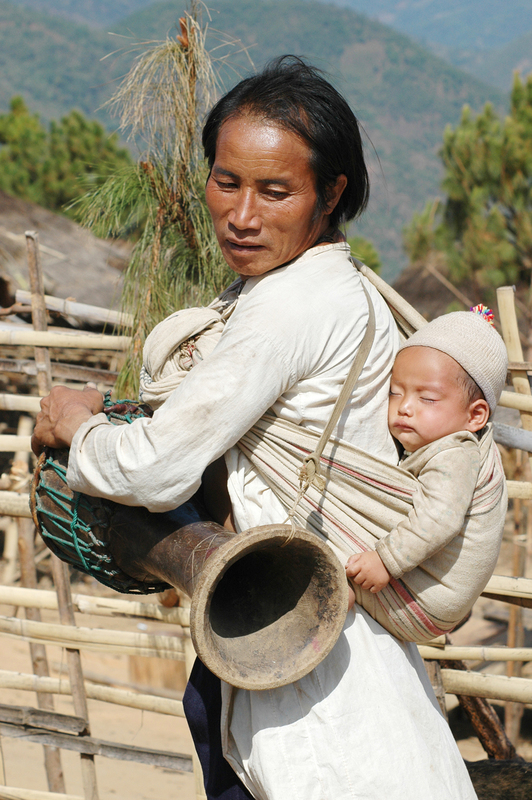 Wan Kong Pyak Tae, Keng Tung, Myanmar, 2005. We rarely present new books on this blog (simply because there are so many), but there is one recent publication not only art and museum curators, but also archivists and librarians should be aware of. The 1970 UNESCO Convention on the Means of Prohibiting and Preventing the Illicit Import, Export and Transfer of Ownership of Cultural Property concerns not only “ancient” works of art or cultural heritage, but also material which could be of a rather recent date. The Convention is not only relevant in regard of collection or acquisition, but also when cultural heritage material is being displayed publicly or made available through digitisation, for example. The book Cultural Property and Contested Ownership, edited by Brigitta Hauser-Schäublin and Lyndel V. Prott (London & New York: Routledge, 2017) provides long awaited insights and experiences from an interdisciplinary point of view by professionals working with cultural heritage material. The book is divided into three parts. Part one is dedicated to the theme Plunder, trafficking and return, and includes contributions by Keiko Miura on Destruction and plunder of Cambodian cultural heritage and their consequences, Alper Tasdelen on Cambodia’s struggle to protect its movable cultural property and Thailand, and Brigitta Hauser-Schäublin who discusses Looted, trafficked, donated, and returned: the twisted tracks of Cambodian antiquities. 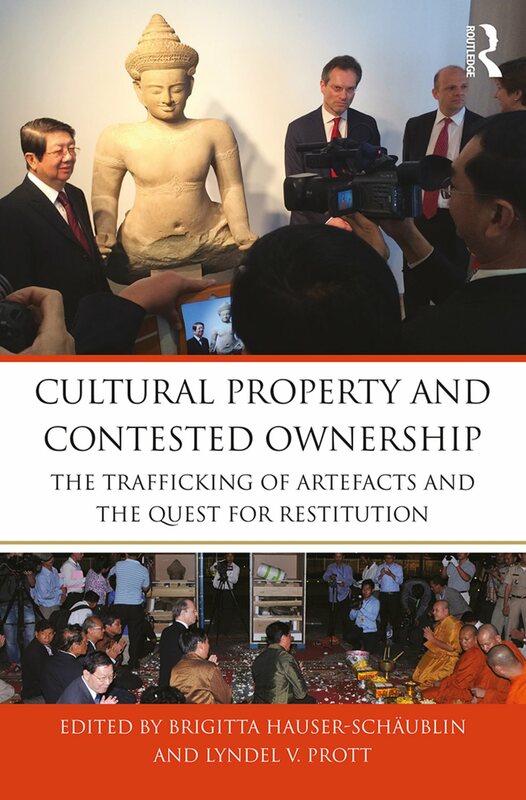 The second part deals with Profit, authenticity and ethics, and contains contributions by Mai Lin Tjoa-Bonatz on Struggles over historic shipwrecks in Indonesia: economic versus preservation interests, as well as by Brigitta Hauser-Schäublin and Sophorn Kim on Faked biographies: The remake of antiquities and their sale on the art market. Part three of the book looks at Negotiating conditions of return, and includes contributions by Barbara Plankensteiner on The Benin treasures: difficult legacy and contested heritage, by Anne Splettstößer on Pre-Columbian heritage in contestation: The implementation of the UNESCO 1970 convention on trial in Germany, and finally by Sarah Fründt who gives insights in Return logistics – repatriation business: Managing the return of ancestral remains to New Zealand. In addition, there are an introduction by the editors and an epilogue. Each article is accompanied by a detailed list of references which are useful for further study of the entire topic. 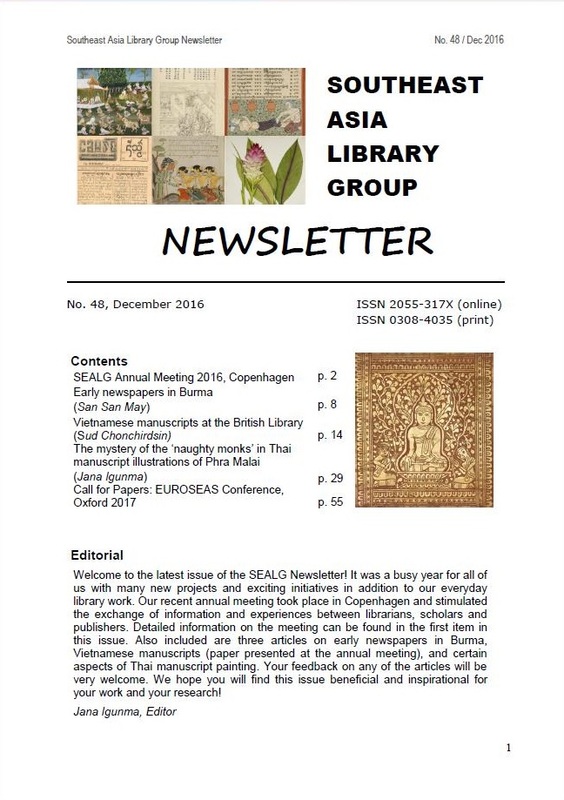 The latest issue of the SEALG Newsletter has been published recently and can now be downloaded from our group’s homepage at http://www.sealg.org/pdf/newsletter2016.pdf . Please feel free to forward the link to anyone you think may be interested in reading the newsletter. Older issues of the newsletter can be downloaded freely from our homepage www.sealg.org. Feedback is always welcome by email to myself (jana.igunma AT bl.uk) which I will forward to the contributors of the newsletter. An online initiative with the title “End of Empire – 100 days in 1945 that changed Asia and the world” by NIAS press was launched recently to commemorate the 70th anniversary of the end of the Second World War in Asia. The initiative publishes day by day ‘real-time broadcasts’ of what happened in Asia at the end of World War II. The site combines daily events with commentary, photographs, maps, personal accounts and other material plus links to resources found elsewhere. Aiming to balance the focus on European events in global public discussions and reminiscences of World War II, the project focuses on a brief, 100-day period at the end of the war across a broad sweep of eastern Asia – a time when the Indonesian and Vietnamese revolutions were born, the fragile wartime truce between Communists and Nationalists in China began to fray, and the first steps were made in Japan towards a new democratic order. The website is part of a radical, multi-faceted project to commemorate the 70th anniversary of the war’s end and its immediate aftermath. This is done not just via the website but also in printed and electronic publications plus via social media. Nor does the project simply present existing scholarship. It also actively reaches beyond the academic world to encourage non-academics to come forward with primary source material unknown to historians and often limited to their own private circles. Here, perhaps, is a model for scholarly publishing and learning that both exploits new technologies and retains traditional standards. One of the great merits of this website is the way it conveys a sense of the fast pace of events in mid-1945 and their interconnectedness across the region at the time. Those who may find the website difficult to navigate may want to consult the Facebook page for the project. The outcome of the initiative is due to appear in published form as End of Empire: 100 Days that Changed Asia and the World edited by David Chandler, Robert Cribb and Li Narangoa. 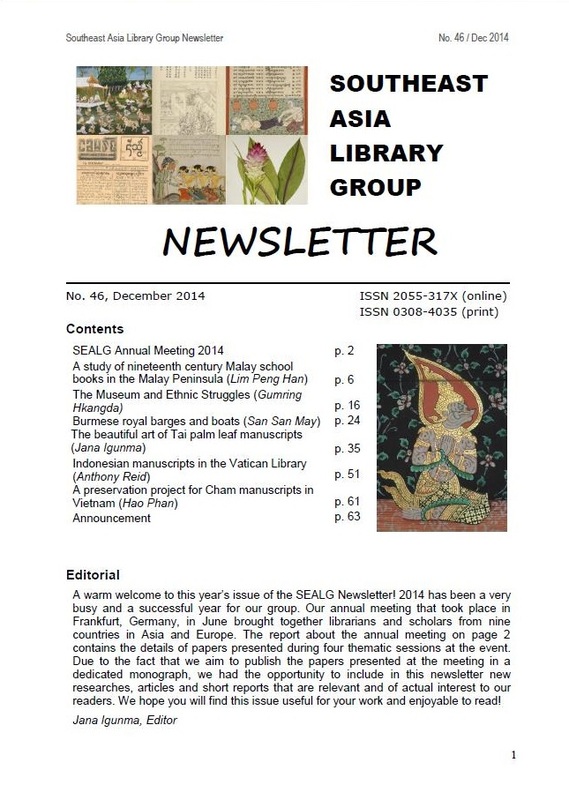 The latest issue of the SEALG Newsletter (No. 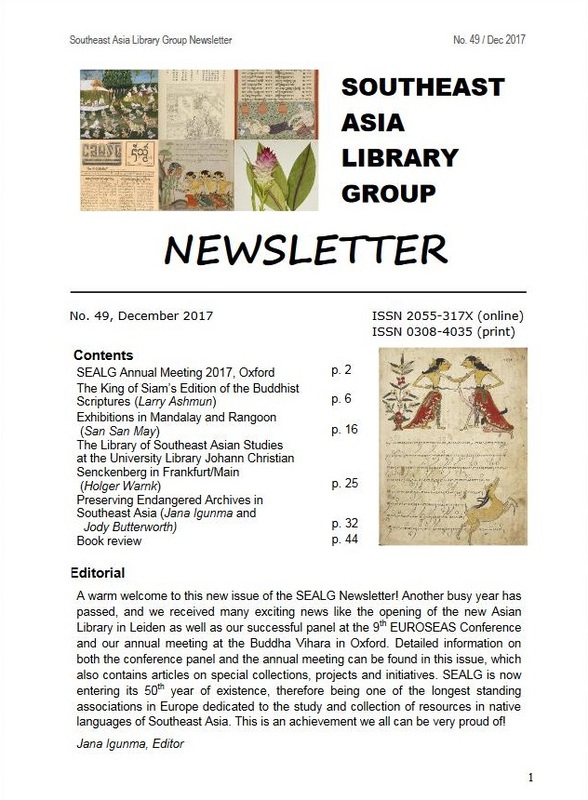 46, 2014) has been published recently and is available online at http://www.sealg.org/Newsletter2014.pdf or via the SEALG homepage (under ‘Newsletter’). Included in the newsletter is the report of our group’s annual meeting that took place in June 2014 in Frankfurt, Germany, as well as articles and project reports, some written by SEALG members and others authored by members of the research community. We are very glad to be able to establish and to further enhance the links between librarians and researchers with this new issue of our newsletter. To receive regular information about the publication of new issues of the the SEALG Newsletter, and of news from our group in general, you may either become a member of SEALG via the SEALG homepage or you may subscribe to this blog. Please feel free to forward this information to anyone who may be interested in our work.